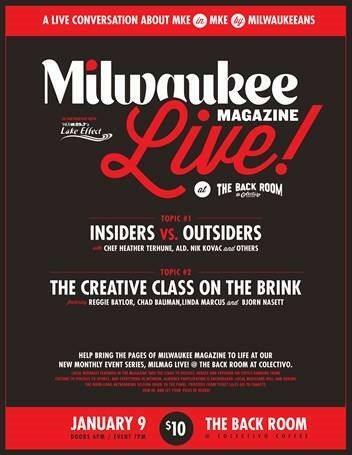 Milwaukee Magazine Moves Off the Page and to the Stage with MilMag Live! Carole Nicksin from Milwaukee Magazine speaking with Lake Effect's Mitch Teich. Milwaukee Magazine is coming to the stage this Monday, in the first of a series of monthly opportunities to catch some lively conversation and music. The magazine is launching its MilMag Live! series in partnership with Lake Effect at Colectivo’s Back Room. Editor-in-chief, Carole Nicksin, says that part of the inspiration for the series was to engage with the community in a more personal setting. "It can seem a little bit one-sided to just put out this print publication, and that's it. And then you go on and you do the same thing the next month," says Nickson. "There's so many great stories and more importantly, great ideas that go into each issue. And I really want the magazine to be the jumping off point for a conversation with the community, an exchange of ideas, and I also want those ideas, in-turn, to find their way back into the magazine." The first MilMag Live! event is Monday, January 9, at the Colectivo Back Room on the east side. The event benefits the Wisconsin Freedom of Information Council. How many fish fries do you go to on an average year? Have you been to every local custard stand to compare and decide who truly has the best chocolate flavor? Maybe your summer isn’t complete without going to a lakefront festival, or tailgating at Miller Park with a properly cooked brat. Depending on the poll numbers you read, Donald Trump appears to be a Republican whose popularity is on the wane in Wisconsin and around much of the country. But here in Wisconsin, one Republican's support has remained pretty constant – at least among her party’s faithful. This week’s news that the National Trust for Historic Preservation has taken up the cause of preserving the Mitchell Park Domes is a good reminder that there are some attractions that are simply integral to Milwaukee. Almost two-and-a-half years ago, we first learned about a novel program that uses the characters and lines of Shakespeare to work with veterans suffering from PTSD and a range of other mental health and reintegration issues.